Evacuating injured pets from wilderness areas. Retrieving pets stranded on cliff sides, river banks, and other areas and structures that can only be accessed safely using ropes, climbing equipment and other technical rescue equipment. Extricating animals trapped in enclosed spaces whose lives are in danger. In cases of emergency, please call your local police department. Is Your Cat Up a Tree? If you see a cat that seems to be stranded in a tree, please follow the steps in our Cat In Tree Information Sheet (PDF – updated June 2018) before calling for assistance. OHSTAR members with animal first-aid and rescue training are available to respond to animal rescue situations that require technical skills in the Portland metropolitan area and adjoining counties. For animal emergencies needing cliff rescue, water rescue, and other urgent situations, OHSTAR responds directly to the incident site. OHSTAR members also assist law enforcement agencies with the safe capture, containment, and transport of distressed animals found in hazardous conditions, including hoarding situations. OHSTAR volunteers are trained to assist during natural and man-made disasters, and have been called upon to assist in large-scale national emergency operations such as Hurricane Katrina and the tornado tragedy in Joplin, Mo. 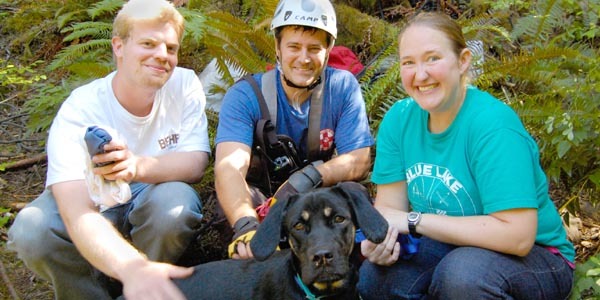 Many of OHSTAR’s rescues occur when a dog has fallen during a hike with his or her people. Keep your dog safe while hiking by keeping him on a sturdy leash. Even the best-behaved dogs can become distracted and bolt when they spot a squirrel or are startled by unexpected happenings on the trail. Below are some links and resources for safe hiking with dogs. OHSTAR is comprised entirely of volunteers, and relies entirely on donations to fund all their rescue activities. Your online donation today to OHS will help OHSTAR and the many other rescue activities supported by OHS. OHSTAR also accepts donations of rescue equipment, such as technical climbing gear. See the OHSTAR Wish List for items that are currently needed. All members serve on a voluntary basis and are required to complete the Oregon Humane Society’s Volunteer Training and Orientation. Although it is highly desirable that members have technical rescue training prior to joining OHSTAR, this is not required: OHSTAR will provide training as needed. OHSTAR accepts applications year round from current/active OHS volunteers, and applicants are interviewed and brought onto the team in groups every four to six months.